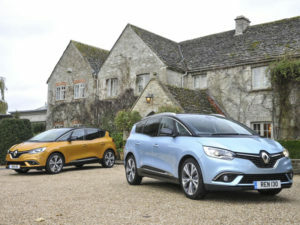 Renault’s new 1.3-litre petrol Scénic and Grand Scénic will be priced from £22,005 OTR with order books to open 1 January. Announced earlier this month, the new unit – developed by the Renault-Nissan-Mitsubishi Alliance and Daimler – debuts first in the Scénic and Grand Scénic line-ups before being rolled out in other Renault models throughout 2018 and onwards. The engine is offered with a choice of two power outputs – the Energy TCe 115 in manual transmission, and the Energy TCe 140 in either manual or EDC automatic transmission – and brings increased torque at low revs and greater and constant availability at high revs along with reduced fuel consumption and CO2 emissions. The Energy TCe 140 engine has a CO2 output of 122g/km (125g/km for Grand Scénic) and achieves 52.3mpg on the NEDC combined cycle with 51.4mpg for Grand Scénic. Meanwhile, the Energy TCe 115 – available in manual transmission only – has CO2 emissions of 122g/km (125g/km for Grand Scénic) and achieves 52.3mpg on the NEDC combined cycle (50.4mpg for Grand Scénic). The new petrol units join the existing three diesels: dCi 110 (from £22,565 OTR), dCi 130 (from £23,605 OTR) and dCi 160 (from £29,305 OTR). The dCi 110 engine is also available as a Hybrid Assist version with a 10kW electric motor powered by a 48-volt 150Wh battery (from £25,055 OTR). UK customer deliveries of the new petrols are expected in February.